Giant jets of subatomic particles moving at nearly the speed of light have been found coming from thousands of galaxies across the Universe, but always from elliptical galaxies or galaxies in the process of merging -- until now. Using the combined power of the Hubble Space Telescope, the Very Large Array (VLA) and the 8-meter Gemini-South Telescope, astronomers have discovered a huge jet coming from a spiral galaxy similar to our own Milky Way. giant jet of speeding particles. For more images, see this link below. 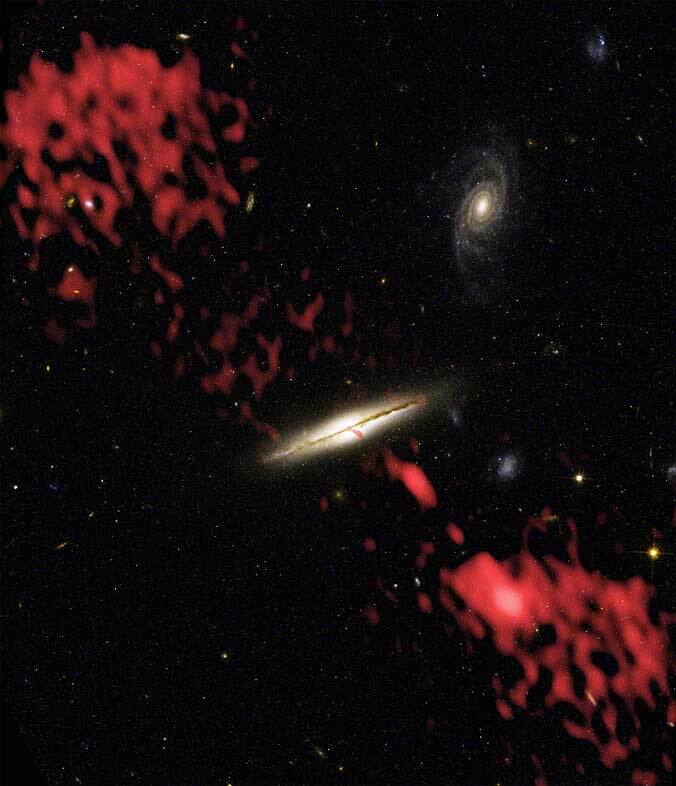 "We've always thought spirals were the wrong kind of galaxy to generate these huge jets, but now we're going to have to re-think some of our ideas on what produces these jets," said William Keel, a University of Alabama astronomer who led the research team. Keel worked with Michael Ledlow of Gemini Observatory and Frazer Owen of the National Radio Astronomy Observatory. The scientists reported their findings at the American Astronomical Society's meeting in Seattle, Washington. "Further study of this galaxy may provide unique insights on just what needs to happen in a galaxy to produce these powerful jets of particles," Keel said. In addition, Owen said, "The loose-knit nature of the cluster of galaxies in which this galaxy resides may play a part in allowing this particular spiral to produce jets." Astronomers believe such jets originate at the cores of galaxies, where supermassive black holes provide the tremendous gravitational energy to accelerate particles to nearly the speed of light. Magnetic fields twisted tightly by spinning disks of material being sucked into the black hole are presumed to narrow the speeding particles into thin jets, like a nozzle on a garden hose. Both elliptical and spiral galaxies are believed to harbor supermassive black holes at their cores. The discovery that the jet was coming from a spiral galaxy dubbed 0313-192 required using a combination of radio, optical and infrared observations to examine the galaxy and its surroundings. The story began more than 20 years ago, when Owen began a survey of 500 galaxy clusters using the National Science Foundation's then-new VLA to make radio images of the clusters. In the 1990s, Ledlow joined the project, making optical-telescope images of the same clusters as part of his research for a Ph.D dissertation at the University of New Mexico. An optical image from Kitt Peak National Observatory gave a hint that this galaxy, clearly seen with a jet in the VLA images, might be a spiral. Nearly a billion light-years from Earth, 0313-192 proved an elusive target, however. Subsequent observations with the VLA and the 3.5-meter telescope at Apache Point Observatory supported the idea that the galaxy might be a spiral but still were inconclusive. In the Spring of 2002, astronauts installed the Advanced Camera for Surveys on the Hubble Space Telescope. This new facility produced a richly-detailed image of 0313-192, showing that it is a dust-rich spiral seen almost exactly edge-on. "The finely-detailed Hubble image resolved any doubt and proved that this galaxy is a spiral," Ledlow said. Infrared images with the Gemini-South telescope complemented the Hubble images and further confirmed the galaxy's spiral nature. Now, the astronomers seek to understand why this one spiral galaxy, unlike all others seen so far, is producing the bright jets seen with the VLA and other radio telescopes. Several factors may have combined, the researchers feel. "This galaxy's disk is twisted, and that may indicate that it has been disturbed by a close passage of another galaxy or may have swallowed up a companion dwarf galaxy," Keel said. He added, "This galaxy shows signs of having a very massive black hole at its core, and the jets are taking the shortest path out of the galaxy's own gas." Owen points out that 0313-192 resides in a cluster of galaxies called Abell 428. The scientists have discovered that Abell 428 is not a dense cluster, but rather a loose collection of small groups of galaxies. In order to see the large jets so common to elliptical galaxies, Owen said, "you may need pressure from a cluster's intergalactic medium to keep the particles and magnetic fields from dispersing so rapidly that the jet can't stay together." However, "A spiral won't survive in a dense cluster," Owen said. Thus, the looser collection of galaxy groups that makes up Abell 428 may be "just the right environment to allow the spiral to survive but still to provide the pressure needed to keep the jets together." In any case, the unique example provided by this jet-producing spiral galaxy "raises questions about some of our basic assumptions regarding jet production in galaxies," Owen said. The National Radio Astronomy Observatory is a facility of the National Science Foundation, operated under cooperative agreement by Associated Universities, Inc. The Space Telescope Science Institute is operated by the Association of Universities for Research in Astronomy, Inc., for NASA, under contract with the Goddard Space Flight Center, Greenbelt, MD. The Hubble Space Telescope is a project of international cooperation between NASA and the European Space Agency. Gemini is an international partnership managed by the Association of Universities for Research in Astronomy under a cooperative agreement with the National Science Foundation..